Manager Sam Allardyce believes Everton are "getting it right" at Goodison Park after a quick-fire start to the second half helped them beat Crystal Palace. Allardyce faced criticism for what he labelled a "pathetic" display in a 5-1 defeat at Arsenal last time out but against the Eagles his side delivered a committed and controlled performance. "I was apprehensive today after being done 5-1 away from home but the players have responded magnificently," said Allardyce, 63. "In the eight home games I have been here, we have picked up 17 points and conceded just four goals. "We are getting it right, entertaining the fans and getting the result," added Allardyce after his side earned only their second win in nine league games. Everton edged a competitive first 45 minutes but nearly went behind in added time when Palace striker Christian Benteke headed the best chance of the half wide. But they added end product to their endeavour after the break, with Gylfi Sigurdsson driving home via a deflection and Oumar Niasse guiding in a headed second less than six minutes after the break. Benteke and debutant Alexander Sorloth each almost got Palace back into the game with headers but it was the home side who continued to dictate play and Tom Davies sealed the win from six yards. Allardyce lost defenders Eliaquim Mangala and Seamus Coleman to injuries but even when Luka Milivojevic punished an Ashley Williams handball from the penalty spot, Palace never looked like creating a frantic finish. The Eagles were simply bettered on Merseyside and now sit 14th, just two points above the relegation zone. Some Everton fans called for Allardyce to be sacked less than three months into the job after the defeat at Arsenal but this display offered the sort of desire that is more likely to strengthen his position. Facing his former club, Allardyce's impact at half-time was clear. He was seen demanding that his side get the ball forward more quickly shortly before the interval and their opening goal arrived when goalkeeper Jordan Pickford rushed to send a long ball upfield within a minute of the restart. Niasse fought for the scraps - as Everton did all day - allowing Sigurdsson to drill home from 25 yards. The timing of the goal was key as it prevented any frustration from home fans setting in and Sigurdsson now has 17 goals from outside the box since he arrived in the league in 2012 - more than any other player. "It looked like Sigurdsson had a point to prove as he was left out last week," said Match of the Day pundit Danny Murphy. "Sometimes he stayed wide and attacked the full-back, sometimes he came into the number 10 role. He grew in confidence. He's calm around the box and I really like him." 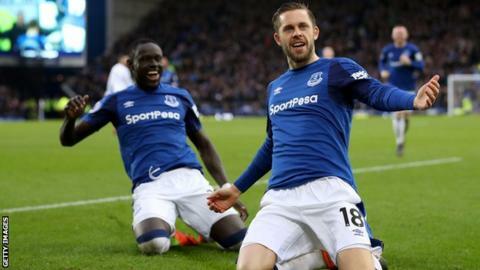 Sigurdsson played alongside Theo Walcott and Davies in support of Niasse in a 4-2-3-1 formation as Wayne Rooney sat in a deep role alongside Idrissa Gueye. Rooney has only been switched to the role in recent weeks but his intelligence was evident throughout as he retained possession smartly, while Walcott looked a constant threat as he saw more of the ball than any home player, with 64 touches. The loss of Mangala and Coleman aside, this was a wholly positive day at the end of a tricky week. Every player in a blue shirt contributed and the Toffees move up to ninth. "The Everton fans will wake up and be happy to see where we are, only two points off seventh," Allardyce added. This was the first Premier League fixture to pit two former England managers against one another since the late Bobby Robson's Newcastle took on Kevin Keegan's Manchester City in 2004. And while it was Palace boss Roy Hodgson who arrived with momentum - after just two defeats in 15 league games - his side never looked keen on taking risks. Sorloth - signed for £9m from Danish side FC Midtjylland - was used up front but when Palace lost the ball he was asked to track back down the left flank, creating a 4-5-1 formation when out of possession. The new signing applied himself to the task and made more tackles than anyone in the away side. But his role meant Benteke was isolated and the Belgium forward's two headed misses - one with the game goalless and one when 2-0 down - were crucial. BBC Radio 5 live pundit Pat Nevin described the second effort as a "very bad miss" and the wasted opportunity left any Palace recovery looking unlikely. They bettered the shot count with 16 efforts on goal but many were from range and there was simply not enough adventure about the away side against opponents who came into the fixture under scrutiny from their own recent failings. A two-point cushion between them and the bottom three looks a slim margin as the Eagles' next five games see them face Tottenham, Manchester United, Chelsea, Huddersfield and Liverpool. Wayne Rooney kept Everton ticking in midfield. His intelligent use of the ball complemented the work ethic of Idrissa Gueye. Both men played 46 passes - an Everton high - with Rooney completing 85%. Theo Walcott and Gylfi Sigurdsson both also impressed but Rooney steered the home side and helped them keep control when they had the lead. No team have won more penalties than Crystal Palace this season (seven), with Luka Milivojevic scoring more goals from the spot than any other player in this campaign (five). Gylfi Sigurdsson has been involved in seven goals in his past six Premier League starts against Crystal Palace - he has scored three and assisted four goals. Tom Davies scored his first goal for Everton since 9 April 2017 against Leicester, 307 days ago. Oumar Niasse both scored and assisted in the same Premier League game for the first time in his career. Everton manager Sam Allardyce: "We have shown what we can do and hopefully we can improve for the rest of the season. "We have to look at our own record and that is where the mainstay of our season lies. In the eight home games I have been here, we have picked up 17 points and conceded just four goals. The unfortunate away form is causing us the problems." Crystal Palace manager Roy Hodgson: "The first half we were good value, certainly for 0-0, and we were confident we could keep going but the early goal in the second half puts you on the back foot. "We played some reasonable football but it was difficult to get back after 2-0. It was a sterling effort from the players and the way they went about their business. We have to accept we were beaten." Both sides have a week off because they are out of the FA Cup so Everton travel to Watford next on 24 February in a 17:30 GMT kick-off. Crystal Palace host Tottenham on Monday 26 February in a 20:00 kick-off. Match ends, Everton 3, Crystal Palace 1. Second Half ends, Everton 3, Crystal Palace 1. Hand ball by Tom Davies (Everton). Foul by Alexander Sørloth (Crystal Palace). Corner, Everton. Conceded by James Tomkins. Goal! Everton 3, Crystal Palace 1. Luka Milivojevic (Crystal Palace) converts the penalty with a right footed shot to the bottom left corner. Penalty conceded by Ashley Williams (Everton) with a hand ball in the penalty area. Attempt blocked. Christian Benteke (Crystal Palace) right footed shot from the centre of the box is blocked. Assisted by Alexander Sørloth with a headed pass. Attempt blocked. Christian Benteke (Crystal Palace) header from the centre of the box is blocked. Assisted by James Tomkins with a headed pass. Corner, Crystal Palace. Conceded by Jordan Pickford. Attempt saved. Patrick van Aanholt (Crystal Palace) left footed shot from outside the box is saved in the top right corner. Assisted by Joel Ward. Luka Milivojevic (Crystal Palace) wins a free kick in the attacking half. Substitution, Everton. Morgan Schneiderlin replaces Idrissa Gueye. Attempt missed. Patrick van Aanholt (Crystal Palace) left footed shot from outside the box is too high following a set piece situation. Yohan Cabaye (Crystal Palace) wins a free kick in the attacking half. Goal! Everton 3, Crystal Palace 0. Tom Davies (Everton) left footed shot from very close range to the bottom left corner. Attempt saved. Oumar Niasse (Everton) right footed shot from the centre of the box is saved in the bottom left corner. Assisted by Jonjoe Kenny. Corner, Crystal Palace. Conceded by Jonjoe Kenny. Attempt blocked. Joel Ward (Crystal Palace) left footed shot from the centre of the box is blocked.